In freezing conditions as low as -20°F, Low Temperature PVC is designed to stay flexible. Have an application in mind that requires flexibility at even lower temperatures? PVCStrip.com’s Extra Low Temperature PVC material is made for extreme cold environments and conditions as cold as -40°F. 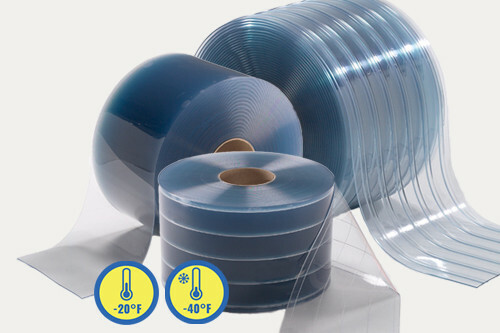 PVCStrip.com offers a variety of low temperature PVC bulk rolls, including smooth, ribbed, and reinforced. Click on the products below to learn more about each type of low temperature PVC strip material.